Home is much more than a shelter from the elements. It’s a place to share life’s simple pleasures like family celebrations and late night conversations with friends. Your guests’ comfort is paramount and the designers at Bassett know that. Bassett offers three types of sleeper mattresses - innerspring, gel foam, or air support. When those late night talks take you into the early morning, you’ll love your Bassett leather sleeper sofa even more than the day it’s delivered. Guests can retire to a comfortable space without having to sacrifice comfort. In the morning, everyone feels refreshed and ready to start the new day. Although we most often associate leather with luxury or sophistication, leather sleeper sofas are above all, practical. Quality construction, cutting edge design, and affordability come together to make Bassett’s collection of sofas the best value on the market today. 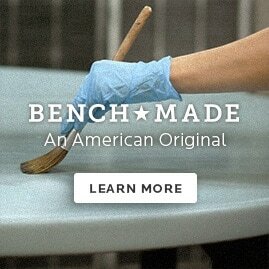 Our design team and artisan craftsmen work overtime to bring you the latest in living room furniture. Every piece is made to last. Best of all, if you don’t see the perfect leather sleeper sofa in our existing line, we offer a complete custom program. With a myriad of leather and finish options, you can add your own personal flair and create something entirely new and completely you. At Bassett, we want your next furniture experience to be extraordinary. It all starts with a visit to a Bassett showroom near you. Speak with a knowledgeable design consultant and let’s work together to create a leather sleeper sofa, coffee table or easy chair that speaks to your personal aesthetic. At Bassett, the possibilities are endless.